Marvel is all anyone can talk about right now, after Avengers: Infinity War opened in theaters this past weekend. I had a great time watching the movie, and it's certainly a fantastic movie theater experience. You can read our spoiler-free review here. And the quality of this huge event film showed at the box office, with Infinity War breaking both the domestic and worldwide records for the biggest opening weekend ever. You can read the details on that here. So it was no real surprise when Marvel announced that a new trailer for Ant-Man and the Wasp would be dropping just days after Infinity War's release. 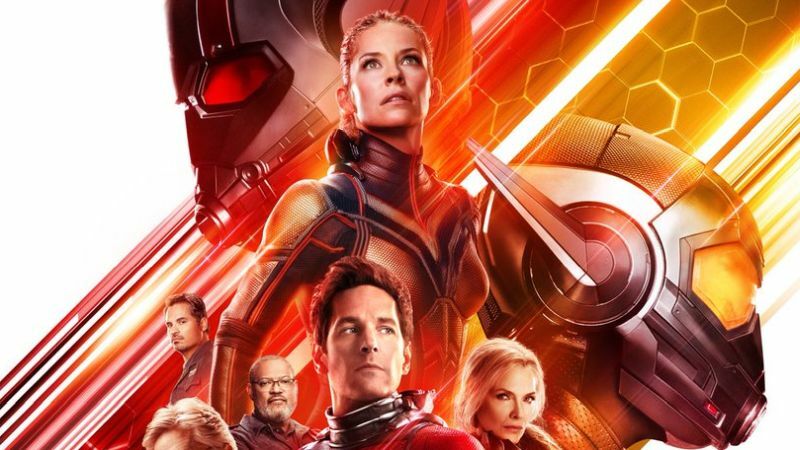 It's not just that it's the next Marvel movie, but where Ant-Man (Paul Rudd) was in Infinity War's marketing was a big question fans had going into the movie. I won't spoil anything about Infinity War, but I will say that, in retrospect, it makes sense why Ant-Man wasn't in any of the trailers or posters. We've known that Ant-Man and the Wasp will take place after Captain America: Civil War, but is set before Infinity War. Still, I think both Ant-Man and the Wasp and Captain Marvel will be key in putting pieces into place for what ultimately happens in Avengers 4. Their placements between Infinity War and Avengers 4 are not accidents; they have a specific plan for these movies. So I was curious to see if this new trailer would give any hints as to how it ties into Infinity War, and now we have that new trailer for Ant-Man and the Wasp, which opens in theaters on July 6. I still like the first trailer for Ant-Man and the Wasp more, but this is a very good trailer. It doesn't spoil anything about Infinity War, or give us any (obvious) hints as to what happens in Avengers 4. And it actually makes the most sense for them to handle it this way. You don't want to drop a trailer for your next film that contains major spoilers for a movie that just came out a few days ago. Still, I thought there would at least be clues. But maybe there are clues, and they just aren't apparent to us yet. I love the continued dynamic between Scott (Rudd) and Hope (Evangeline Lily). They have great chemistry, as well as very entertaining back-and-forth. It's also great to see Michael Peña back, after he was mostly absent from the last trailer. His role in this trailer was pretty much to just explain all the exposition, but if you have seen the first Ant-Man, you know that actually makes sense for his character. In both of these trailers, the action looks incredible. Director Peyton Reed is making great use of Ant-Man's growing and shrinking, and that helps in making him a more interesting character. Not only is he a great, well-developed character-- and played excellently by Paul Rudd-- but he has a unique skill set that is actually incredibly useful in combat, and that all helps sell his character. The biggest thing, for me at least, is seeing Laurence Fishburne at the end of the trailer. I've had a theory for a while that this movie was going to set up the original Avengers, a team from the 1960's that included Michael Douglas' Ant-Man, Michelle Pfeiffer's Wasp, Laurence Fishburne's Goliath, and more. And it seems like that is what we will be getting. This team, I think, will be the biggest thing in this movie, and will have a lasting impression on the entirety of the Marvel Cinematic Universe. Overall, I like the first trailer more, but this new trailer for Ant-Man and the Wasp is really good, and I'm excited to see the film in just a couple months! What do you think? Did you like the second trailer for Ant-Man and the Wasp? Are you planning on seeing the film? Leave your thoughts in the comments section below.